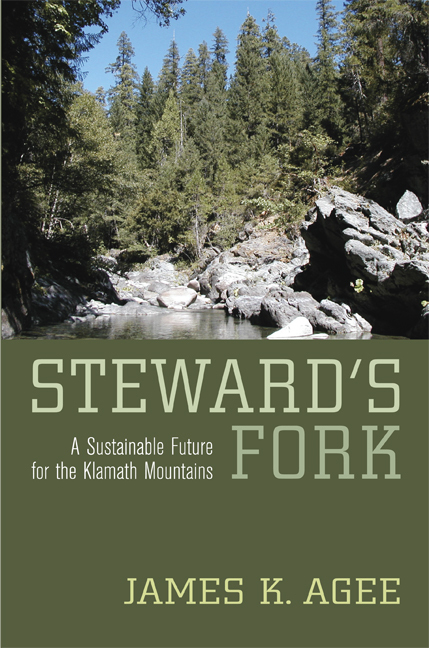 A compelling story of place, Steward’s Fork explores northwest California’s magnificent Klamath Mountains—a region that boasts a remarkable biodiversity, a terrain so rugged that significant landscape features are still being discovered there, and a wealth of natural resources that have been used, and more recently abused, by humans for millennia. James K. Agee, a forest ecologist with more than fifty years experience in the Klamaths, provides a multidimensional perspective on this region and asks: how can we most effectively steward this spectacular landscape toward a sustainable future? In an engaging narrative laced with personal anecdotes, he introduces the dynamics of the Klamath’s ecosystems, including its geology and diverse flora and fauna, and then discusses its native cultures and more recent inhabitants, laying out the effects of industries such as logging, mining, water development, and fishing. Assuming that people will continue to have a close tie to the Klamaths, Agee introduces the principles of restoration ecology to offer a vision of how we can responsibly meet the needs of both people and natural organisms, including plants, fish, and wildlife. This debate over the future of the Klamath’s rich landscape widens into a provocative meditation on nature, culture, and our relationship with the earth itself. James K. Agee is Virginia and Prentice Bloedel Professor of Forest Ecology in the College of Forest Resources at the University of Washington. He is author of Fire Ecology of Pacific Northwest Forests, coauthor, with R.L. Edmonds and R.I Gara, of Forest Health and Protection, and coauthor, with D.R. Johnson, of Ecosystem Management for Parks and Wilderness.